Sodium dodecyl sulphate-polyacrylamide gel electrophoresis (SDS-PAGE) of unreduced total protein extracts from the endosperm of hexaploid wheat revealed three high molecular weight protein bands (triplet bands) in a zone of heavy background streaking. Electrophoretic examination of 135 hexaploid cultivars showed at least five different patterns of these triplet bands. Nine durum wheat cultivars showed a single band only. 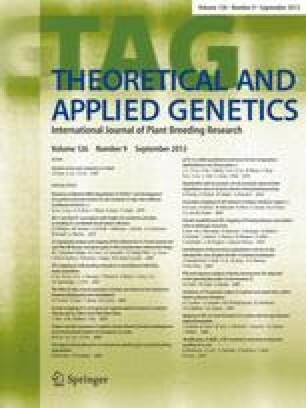 Analysis of nullisomic-tetrasomic and ditelocentric lines of ‘Chinese Spring’ wheat revealed that the slowest moving band (Tri-1) of the triplet was controlled by gene(s) on chromosome arm 1DS and the fastest moving band (Tri-3) by 1AS. The band with intermediate mobility (Tri-2) was found to be a hybrid aggregate of the subunits controlled by 1DS and 1AS. Using a non-reducing/reducing form of 2-dimensional (2-D) electrophoresis, these triplet bands were shown to be heterotetramers of four subunits designated D (M.W. 58,000), δ (22,000), A (52,000) and α (23,000) where Tri-1=DδDδ, Tri-2 = DδAα and Tri-3 = AαAα. With very low concentrations of 2-mercaptoethanol (ME), the tetramers dissociated into dimeric subunit pairs (Dδ, Aα), the monomers being observed with higher concentrations of ME. The structure of these subunit pairs resembles that of the subunit pairs in the globulin storage proteins of oats and some legumes. The 2-D method employed in this study was useful also for separating low molecular weight (LMW) subunits of glutenin from the monomeric gliadins which have similar electrophoretic mobility in 1-D separation. It was shown that at least four of these LMW glutenin subunits are controlled by genes on 1DS and 1AS and at least one subunit is controlled by gene(s) on 1BS. This electrophoretic separation method has proven useful in understanding the aggregation behaviour of the seed proteins of wheat.